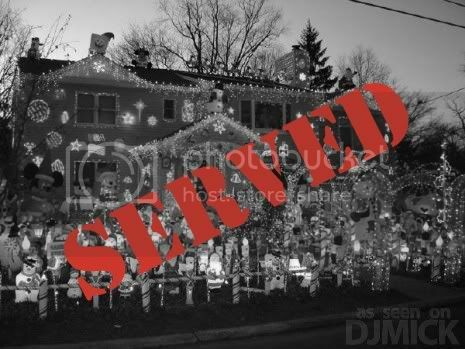 SERVED: Tis the season for the least artistic people in the world to decorate their homes in Christmas lights that burn the eyes. The lights are in every color imaginable and have to be flickering in annoying patterns that cause seizures like a Pokemon game. But then someone says, "Hey, the lights are gaudy enough- add more decorations!" It's then that said house paints 6ft tall toy soldiers on plywood and head to their local K-Mart to buy every inflatable Santa, snowglobe, and lit-up seal and dolphins. It's not festive, it's tacky. You want to stop global warming? Stop spending thousands of dollars on electricity in the month of December. Your eyesore of a house is annoying me and that is why I SERVE you, obnoxiously decorated holiday homes.